This category caters for all instruments, on which the melody can be and is played, not catered for in the competitions 1-13. Electronic, mains or battery-powered instruments are not accepted. In competitions for Rogha Ghléas, a competitor may compete on one instrument only. In all Miscellaneous competitions the instrument, and tuning if relevant, being played shall be listed on the Official Fleadh Entry Form. This competitor/instrument combination must be maintained at all subsequent Fleadhanna in that year. 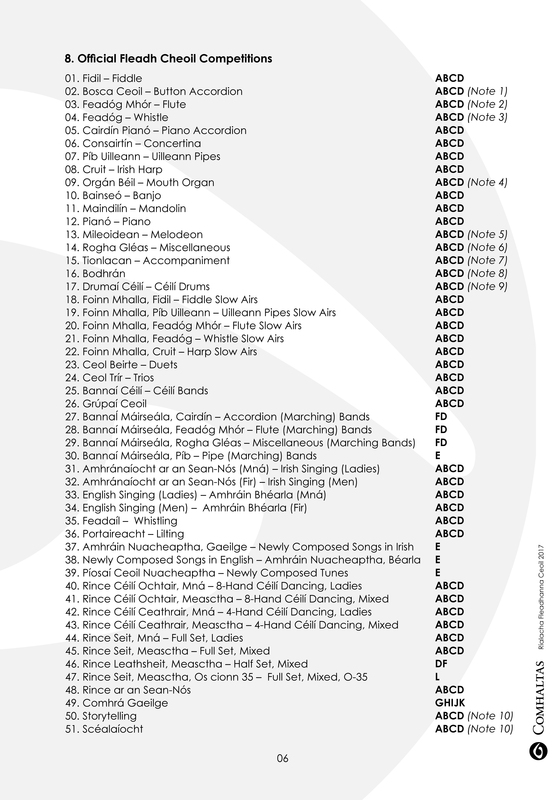 In all Fleadh programmes the competitor listings for Miscellaneous Competitions shall include the competitors name and instrument.